From the American Revolution to the French Revolution, from the civil rights era in the United States to Arab Spring in the Middle East, the ongoing battle for freedom and democracy is a profound and fascinating study of the power of human will to change the world. Civic Unrest: Investigate the Struggle for Social Change examines the history behind civic unrest and the methods people use to fight for basic human rights such as freedom of speech and the right to vote. Civic Unrest discusses the different reasons for and methods of revolution, while offering young readers the opportunity to learn about the structure of the U. S. government and how the elements within the U. S. Constitution were decided upon by the Founding Fathers. Activities use elements of history, civics, and mathematics to interpret data, create maps, and debate issues. These enrich learning and encourage students to ask questions, make inferences, and draw conclusions while allowing for a hands-on immersion in the complex elements of civic unrest and democracies. 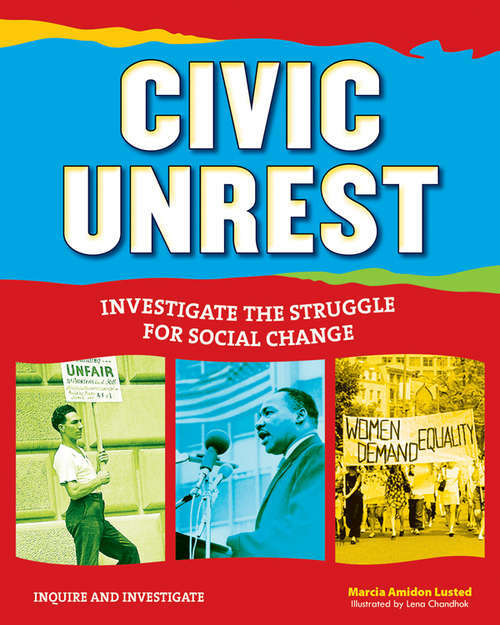 Civic Unrest: Investigate the Struggle for Social Change meets Common Core State Standards for literacy in history and social studies; Guided Reading Levels and Lexile measurements indicate grade level and text complexity.